Tsukushi gets thrust into the spotlight after she speaks up for a classmate who has accidentally offended the leader of the F4, Tsukasa Domyoji. Everyone is in awe and in fear of him and his crew. They are considered the super elite at the school, and someone would be considered a fool to cross the F4, mainly Tsukasa. Because Tsukushi decides to stand up for what’s right and not keep her mouth shut, she pays severely for this by being red carded––a dreaded mark that means you will be targeted by the entire student population’s awful abuse on behalf of the F4. In most cases, this is the worst thing to happen to a student at Eitoku. Many victims who faced this kind of harassment have switched schools entirely because of the humiliation and harsh cruelty. While many victims before Tsukushi may have been successfully run out of the academy, Tsukushi herself refuses to surrender. She takes this brand of punishment the best way she can until she finally snaps and decides to give Tsukasa what is coming to him––a punch in the face and a declaration of war against him and the F4. Tsukushi is an interesting shojo heroine in how she handles herself. She has a no-nonsense attitude, is brave to stand up against the worst of her bullies, and she fights back rather than take the crap dealt to her. Tsukushi isn’t a pushover and many are quick to realize this about her. She has an innate ability to not turn away from something that’s wrong, which is why she’s one of the strongest heroines in shojo manga. Tsukushi is also the first person to ever have the guts to stand up to Tsukasa and the F4’s nonsense. This actually earns the F4’s and Tsukasa’s respect, and they are intrigued by that spark she possesses. Despite having those qualities, Tsukushi does have her own set of insecurities she has to contend with. At times she feels self-conscious about her looks and status among the elite classmates she goes to school with. Tsukushi knows she won’t ever quite measure up to them, and coming to that conclusion is painful in its own way. Her vulnerabilities show more in Volume 11 of the manga when she has to compete in the Miss Teen of Japan pageant. Tsukasa’s sister Tsubaki is doing everything in her power to make Tsukushi a worthy contender in the pageant, but Tsukushi knows her chances of winning are slim when she meets all her competitors. She starts doubting herself and comparing herself to the other girls in the pageant with her. Knowing she won’t ever be the best at speaking English, pouring tea like a proper lady, or having the best fashion sense, Tsukushi is nearly overwhelmed by the sheer magnitude of her shortcomings and her fear of becoming a failure. It takes a pep talk from Tsukasa to give her the encouragement she needs to press on further. He reminds her of what makes her unique and to give it all she has got. The opening scene of the manga has Tsukushi remembering how as a little girl she wished to grow up and become a princess. Now that Tsukushi is older and reflects on that innocent wish she has made, she calls it her first great disappointment in life when reality came crashing down on her. However, she also comes to grips with having to become the person only she can be and no one else. The voice over in that first page is the set up for how Tsukushi realizes she’s a fighter and not a quitter. In spite of insurmountable odds that may be stacked against her, Tsukushi will keep pushing against them until she comes through to the other side. This is why I really enjoy reading Hana Yori Dango because Tsukushi is the prime example of someone who will keep going in the face of adversity. Hardship and struggle doesn’t scare her. It toughens her up and she is able to realize what she is capable of. Somehow, Tsukushi will get through them all. It’s a difference between sinking or swimming in the harsh realities we call life. I can relate to Tsukushi’s refusal to give up and having to face a good amount of struggle in her life. To a certain degree, I have faced my own share of struggles and hurdles in life. A lot of tears were shed and I wondered why I have to struggle so much. In the end, like Tsukushi, you have to keep going and not let life defeat you. I rather keep fighting than give up. This may sound cliche, but struggle does build character. By never giving up, you eventually see the fruits of your labor. Tsukushi is the diamond in the rough who will shine brightest when she doesn’t lose her own sense of self-worth. As an admirable character in shojo manga, Tsukushi expresses the message of celebrating your individuality, embrace your shortcomings, and never wish to be anyone but yourself. You are you, and that’s a beautiful thing. I’ve been a long time fan of Makino Tsukishi; HYD is also one of my earliest ever anime, so it forever holds a special place in my heart. Tsukushi is still one of my favorite leads and I don’t think I’ve ever come across a rendition of her, in any of the various Asian live action dramas, the anime, or manga where I didn’t like the actress who played or voiced her. And even re-reading the manga and watching the anime with their dated art style, I always quickly overlook the faded colors and lines. I’m also a big fan of Yuuki’s character, and how loyal she always is to their friendship. For some reason she’s always portrayed as prettier than Tsukushi; maybe I’m forgetting a description in the manga where this is stated? I think Tsukushi is one of the most well-written shojo heroines out there. There are times when maybe her indecision between Rui and Tsukasa is frustrating, but when it comes to demonstrating how she’s a strong and independent girl who won’t let anyone step on her, that makes her a character to look up to and aspire to. What’s also great about her is the fact that she isn’t perfect or the super pretty shojo heroine type you see in other mangas. This makes her accessible and realistic as a character. You can relate to her because she isn’t the gorgeous girl who everyone puts on a pedestal, but a really normal girl who has personality and shows her beauty in other ways. It’s no wonder Tsukasa and many other guys in the manga are attracted to her! I also like Tsukushi’s strong personality. You have pretty much said everything I think about her (XD), but all in all she’s one of my favorite shoujo heroines. The manga is really good. I’m still slowly trying to collect all the volumes, but there’s more character development and story progression in the manga that you don’t get in the anime or live action film/TV. Great post! This may not surprise you (haha), but Tsukushi Makino is one of my favourite female characters in any manga ever! Her strength, resilience and determination are definitely qualities that I look up to. She has her flaws, but she’s true to herself every step of the way and that’s hard not to like. I wish we had more shojo heroines like that out there! Nope, this doesn’t surprise me at all, you being a strong and kickass female yourself. 😉 I do agree with you on needing more shojo heroines like Tsukushi. While I do read a ton of shojo, I do notice a lot of shojo heroines in other series I’ve read so far are pretty bland or meek. I love how Tsukushi just stands out from all the rest. Good on Yoko Kamio for creating such a likable and realistic heroine! I did watch the newish Japanese TV series with Matsumoto Jun and Inoue Mao a long time ago. I really liked that one along with the movie they made to wrap up the entire TV series. I never got to see the Taiwanese version, but I’ve heard it wasn’t a bad adaptation either! I really wish there were more heroines like Tsukushi in shoujo. I’m of the mindset that heroines should inspire us and Tsukushi definitely inspired me. I really hate reading about a girl who can’t do anything. Do you want to depress me manga? 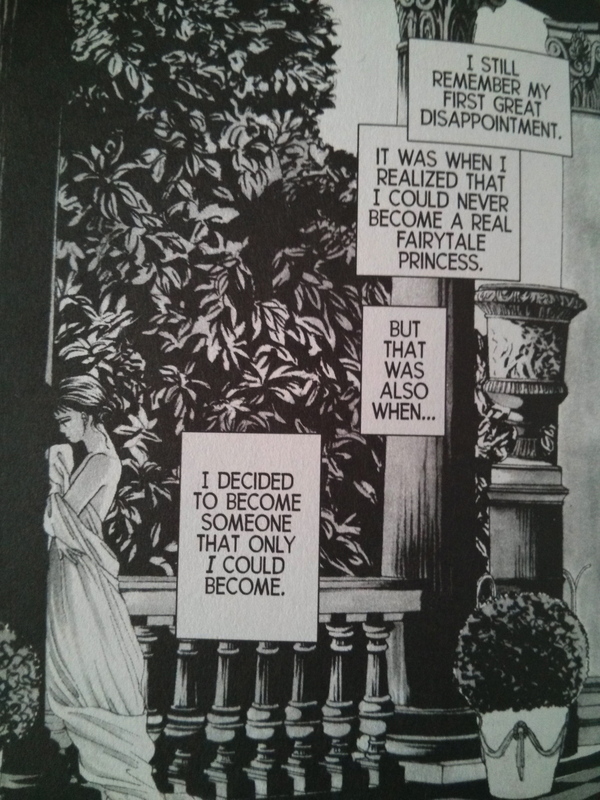 I did notice that shojo manga sometimes lack strong heroines. I find the more passive, damsel-in-distress types to be largely boring. I like my female characters strong, confident, and who look out for themselves and others. Tsukushi sure is an inspiring character. Hi i just want to tell you , that i really liked your post. It shames there are no many people who know about this manga. For me is the best manga shoujo i ever read.